Big Holiday Discount - Limit 1 Set per Order. 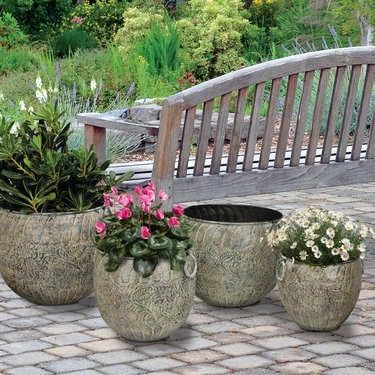 Bring a touch of Regal elegance to your potted plants with our new Green Flower Nesting Planters! These metal planters are created from a flat sheet of metal which is hand-turned on a lathe to give the shape. Each piece is then tooled by hand to create the textured patterns. Finished with a powder coating for weather resistance and layers of handpainted colors to highlight the designs. Cast iron handles make these planters easy to move.